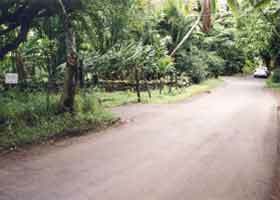 This is page 2 of photos, from my October 1999, May 2000, and November 2001 visits to Maui (plus one historic road photo), of the Hana Highway along the northeast and east Maui coasts (state routes 36 and 360, and part of county route 31). 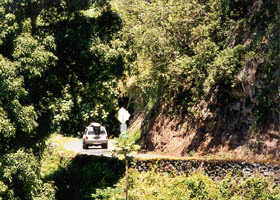 Page 1 provides introductory information about the entire highway, including a map, plus photos of or from the highway from Paia near its western end, east to the end of state route 360 in Hana. 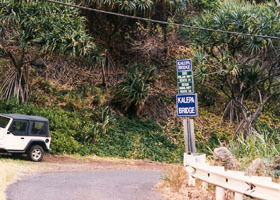 The photos below complete the journey, over county route 31 from Hana to Kipahulu, where the Hana Highway meets the Piilani Highway (remainder of county route 31) at Kalepa Gulch. 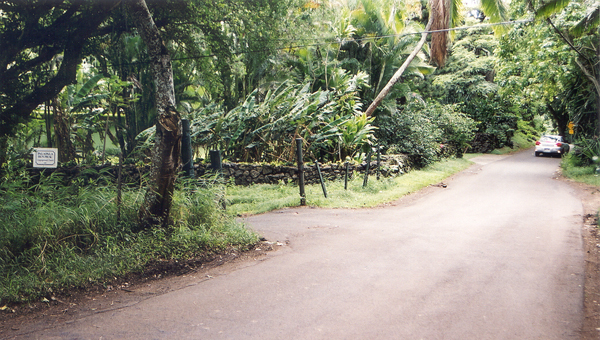 This page covers the county route segment of the Hana Highway in reverse milemarker order, from north (mile 51.8) to south (mile 38.6), for continuity with page 1. 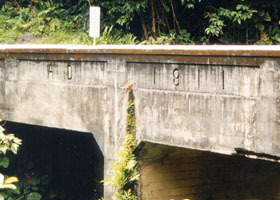 Maui County commissioned a study, completed in 2001, of the county-maintained bridges on the county route 31 segment of the Hana Highway, covered in the photos on this page. 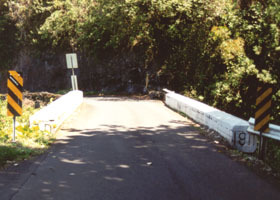 The study focused on needed maintenance or sometimes replacement of the bridges, consistent with their historic designation as part of the Hana Highway Historic District. It includes lots of great bridge photos. 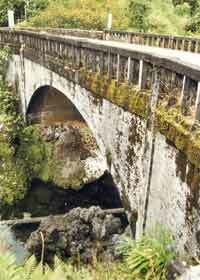 The complete report can be downloaded from the Hana Bridges page of the Maui County web site (page works best in Internet Explorer; long 15 MB download). If you just want to review the photos, you can selectively download from that page Appendix A (four parts, 5 MB total download). See also the Hana Highway page of my Road Geek Souvenirs Collection to see some colorful Hana Highway T-shirts and other souvenirs I brought back from Maui. Kurumi has jokingly suggested (“if my conscience ever evaporates,” he emphasizes) building a six-lane Interstate tollway to replace the Hana Highway, to reduce travel times from three hours to thirty minutes, and thereby "enhance economic development in the Hana metro area." After 10 rides down this tollway, he proposes giving away a free T-shirt. That suggestion inspired this proposed T-shirt design by C.C. Slater (featuring a gecko, Maui's "official" reptile). 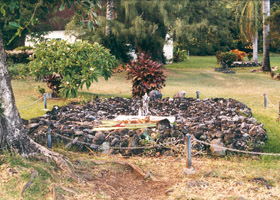 Angela Kay Kepler, Maui's Hana Highway (1995). 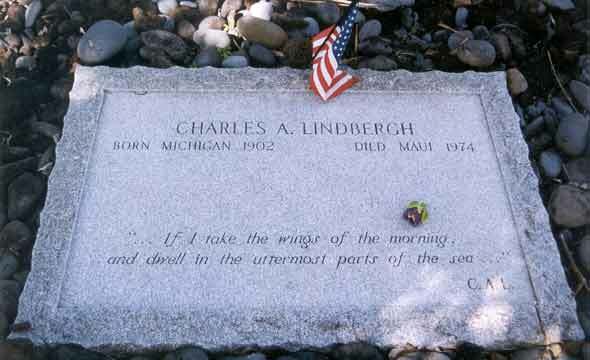 Very, very detailed guide to the highway, with lots of gorgeous photos of sights along the way (especially the flowers). 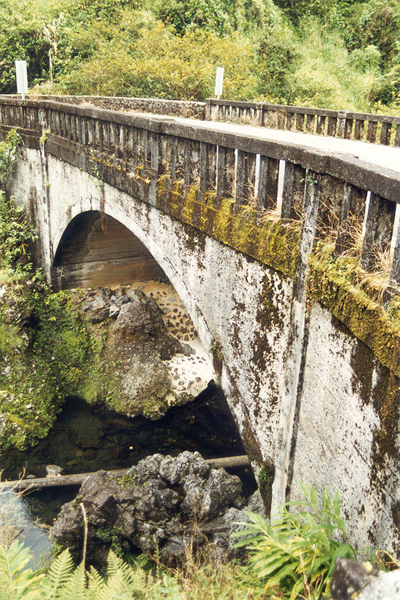 Barbara and Robert Decker, Road Guide to Haleakala and the Hana Highway (1992). 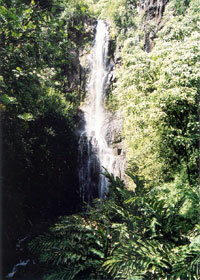 The Hana Highway section is short, but has detailed directions to the best places to stop along the way, as well as lots of photos. 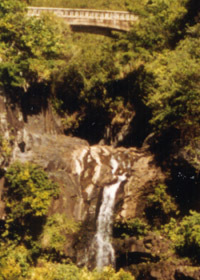 Richard McMahon, Scenic Driving Hawaii (1997) is a great guide to scenic Hawaii roads in general, and includes an eight-page guide to the Hana Highway (including brief coverage of the Piilani Highway). 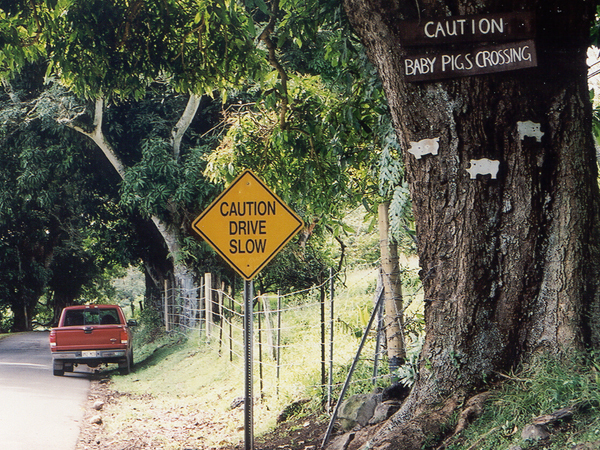 Richard Sullivan's Driving and Discovering Hawaii: Maui and Molokai (1998) includes about three dozen pages full of wonderful Hana Highway photos, as well as handy hints on where to stop to take your own photos. J.D. Bisignani, Maui Handbook is one of the Moon Travel Handbooks which were my main trip planning reference for my trips to Hawaii. 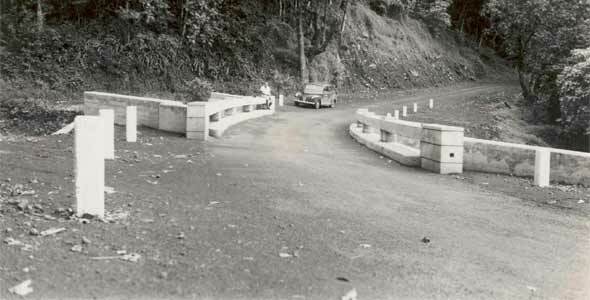 It includes a 30-page discussion of the Hana Highway (including brief coverage of the Piilani Highway). 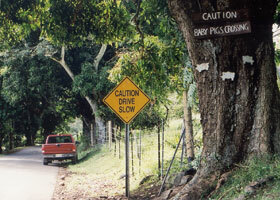 Mark Furqueron's Hawaii road photos page has some Hana Highway photos. 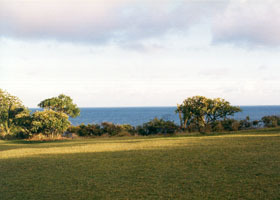 © 1999-2008 Oscar Voss (no copyright claimed on National Archives photo, which is in the public domain).